The villa is build at a unique location on Bonaire with direct access to the ocean. A beautiful tropical garden, which will attrack the (humming)birds, sundeck and porch make this a very nice place to relax and enjoy your holiday. It doesn't matter if you are with a group of divers, as a family or in a wedding group. During the day you can snorkel or dive the famous Bonaire reef right in front of the house. The sunsets from under the pergola or the sun bath area, directly located at the seaside, are stunning to see. 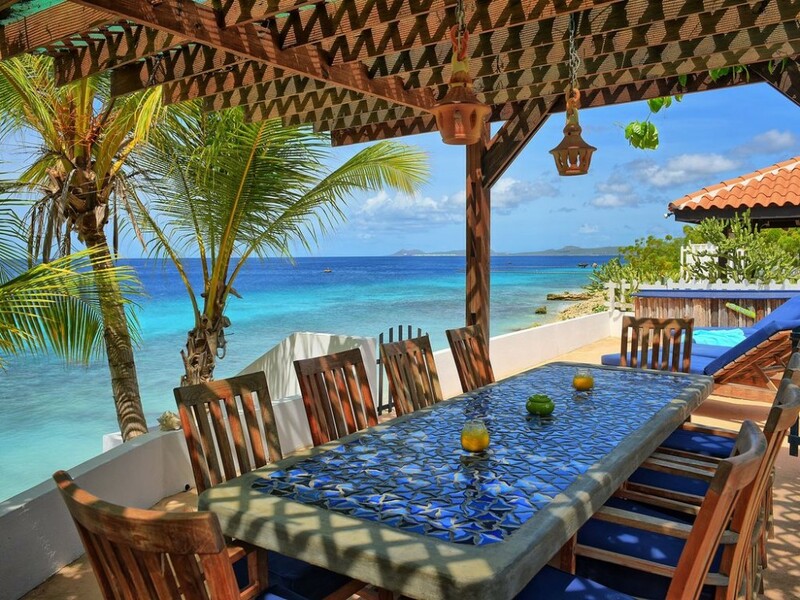 Bonaire Sunset Villa has five bedrooms. Every room has a safe, TV and air-conditioning. It has just recently been redecorated. After a busy day you can relax in the garden, take a nap in the hammock, read a book, work on your tan or enjoy a lovely barbeque in the garden. This villa is ideal for divers. Just outside the backyard there is the famous dive side named 'Cliff'. The house also has beautiful underwater pictures on the walls, all taken on Bonaire. The house has been renovated with divers in mind. There are secured lockers with special hangers for dive gear, two rinse tanks and an outside shower.Next to the lockers there is a covered area to dry your dive gear. There is also a dive bench, easy to put on or take of your dive gear. On the same bench you also can store your air/nitrox tanks safely. This is all easily accessible from the parking lot, should you do a dive on any of the many other dive sites on Bonaire. Service charge 10%. Includes, (beach) towels, linen, (final) cleaning, water, electricity, property manager 24/7, WiFi. Tourist tax $ 5.45 per day per person. Our small group of three couples recently returned from a fabulous trip to Bonaire and a perfect stay at Sunset Villa. The villa was truly exceptional. The location was perfect. Less than 100 feet to a nice dive shop, across the gravel drive from a nice pool, and set toward the end of a short row of similar villas this home couldn't have been more perfectly placed. Every bedroom was exceptionally appointed and thoroughly clean. The attached bath for every room, private televisions and small refrigerators, private safes, and powerful air conditioning made every sleeping area comfortable. The kitchen was huge and had every tool you could need to cook your own meals. The appliances are stainless and new. The full sets of dishes, pans, and silverware are in excellent shape. Plug-ins were ample throughout the house. The inside seating areas were rarely used. We appreciated the den area complete with an array of books about Bonaire and a cell phone for our use.There were ceiling fans everywhere to help keep the house cool during hot days without full-house air conditioning. The garden was fabulous. The plants were in bloom and smelled heavenly. The two dining tables -- one by the house and one by the ocean -- were both perfect for our group and could easily have seated 8 or more. There were private seating areas in the garden, and beach chairs oceanside. A few private steps down from the garden is easy access to terrific dive sites where we had some lovely dives. The house comes with a fabulous dive gear cleaning station. Two huge tubs to soak gear; a shower; a separate tub for cleaning cameras. The lockers were huge and easily fit 2 sets of gear. Much bigger than any dive resort provides. There was a hanging rack with pegs for fins and hangars for wet gear. Across was a long bench with places to store tanks securely. I can't think of anything that could be improved with this set up. The owner, Lamber, was equally excellent. Response time was short. He replied to every question and every email quickly. He worked to get us set up with dive shop and vehicle rental. He made referrals for fishing. We had difficulty with the safe and he came over quickly to fix it. He could not have been more helpful or friendly. He could not have been more helpful; I would rent from his again in a heartbeat. You can't go wrong with Lamber, and can't go wrong with this villa. It -- and Lamber -- were simply outstanding and I recommend this rental without reservation. We recently returned from our 5th stay at Bonaire Sunset Villa (our 8th stay on the island in 9 years) and we truly can't imagine staying anywhere else! We had already booked our weeks for next year before boarding our return flights to the states in March. Each year we try to share this treasure of a property with a few new friends and they always want to be invited back! The owners of this villa are wonderful people and are the most accommodating of anyone we have ever rented from. They are a pleasure to work with and were very flexible with our seemingly ever-changing needs this year ... even helping with an unexpected second car rental at the last minute. Lamber will go out of his way to ensure his guests enjoy a worry free holiday! The villa is very well appointed (including the addition of an ice maker since our last stay), the beds are comfortable and the rest of the time we spend outside in the magnificent garden, relaxing by or in the water and exploring the wonders of the island! We couldn't believe all the flamingos we saw on the island this year! We can't wait to return in 2018. I chose this rental because of the reviews of the owner. He was helpful and accommodating from the start. The house is perfect and well set up. Each of the five bedrooms is unique, comfortable and has its own bathroom. The kitchen is well equipped and we arrived to a bottle of wine, a small selection of beer, and some snacks to nibble on before deciding where to go for dinner. The garden is on the ocean and is a restful, quiet place to sit and watch the hummingbirds and butterflies. The ocean access has the best snorkeling and diving on the island. We received excellent advise and help arranging the truck rental and our diving arrangement. We also got excellent recommendations for restaurants and sites to visit around the island. We all loved this house and very much did not want to leave. We will definitely be back to Bonaire and will stay here! You could not ask for more! Our reservation was made nearly a year in advance. Throughout the many months preceding our stay, there were quite a few details that needed to be addressed due to our large group size. Lamber was quick to respond to every email with an answer to every question and every concern. He was a superb facilitator for everything before our arrival and during our stay. He arranged for our diving packages, our car rental and transportation to and from the airport, and was quick to adjust to circumstances beyond our control like our very late flight arrival. One email to Lamber advising him of our delayed arrival time, and our transportation from the airport to the Villa was right there waiting for us in the dark of night! Lamber even helped to find a doctor and make an appointment for one person in our group who needed medical treatment. It's one thing to find a very nice place to stay, and it's another thing to have a Villa owner who knows the local businesses, speaks several languages, and is committed to making his guests comfortable, and their stay trouble-free. With Lamber you have both, a magnificent villa, and a host who has everything completely taken care of for you. I could go on to describe the beauty of his Villa, the deluxe decor of every room, and how it is aptly named the "Sunset Villa" due to the spectacular view of the setting sun from it's beautiful garden patio, but all of the other reviews already do an excellent job of describing the villa. So I figured that I would make better use of my review space by emphasizing how important it is to have an owner as attentive, capable, personable, and trustworthy as Lamber to efficiently handle all matters involved with the renting his villa in order to help ensure a most enjoyable vacation experience. The Sunset Villa gets all 5 stars.